No, I haven’t learned German in my spare time , an interview with me about intelligent capture was translated for a German-language magazine. …then scrolling down to see that ABBYY is featuring the paper that I wrote for them as follow-on bonus material! Nathaniel Palmer and Carl Hillier are both intelligent speakers with long histories in the industry, tune in to hear them talk about the role that content capture and content analytics play in digital transformation. Data capture from paper or electronic documents is an essential step for most business processes, and often is the initiator for customer-facing business processes. Capture has traditionally required human effort – data entry workers transcribing information from paper documents, or copying and pasting text from electronic documents – to expose information for downstream processing. These manual capture methods are inefficient and error-prone, but more importantly, they hinder customer engagement and self-service by placing an unnecessary barrier between customers and the processes that serve them. 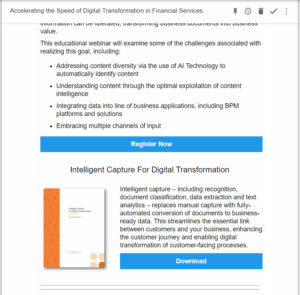 Intelligent capture – including recognition, document classification, data extraction and text analytics – replaces manual capture with fully-automated conversion of documents to business-ready data. This streamlines the essential link between customers and your business, enhancing the customer journey and enabling digital transformation of customer-facing processes. Datenerfassung. Dokumente werden vollautomatisch in geschäftlich nutzbare Daten umgewandelt. steigern und die digitale Transformation kundenorientierter Prozesse vorantreiben. Recently, I was interviewed by KVD, a major European professional association for customer service professionals. Although most of their publication is in German, the interview was in English, and you can find it on their site here. Chip VonBurg, senior solutions architect at ABBYY, gave us a look at machine learning in FlexiCapture 12. This is my last session for ABBYY Technology Summit 2017; there’s a roadmap session after this to close the conference, but I have to catch a plane. He started with a basic definition of machine learning: a method of data analysis that automates analytical model building, allowing computers to find insights in data and execute logic without being explicitly programmed for where to look or what to do. It’s based on pattern recognition and computational statistics, and it’s popping up in areas such as biology, search and recommendations (e.g., Netflix), and spam detection. Machine learning is an iterative process that uses sample data and one or more machine learning algorithms: the training data set is used by the algorithm to build an analytical model, which is then applied to attempt to analyze or classify new data. Feedback on the correctness of the model for the new data is fed back to refine the learning and therefore the model. In many cases, users don’t even know that they’re providing feedback to train machine learning: every time you click “Spam” on a message in Gmail (or “Not Spam” for something that was improperly classified), or thumbs up/down for a movie in Netflix, you’re providing feedback to their machine learning models. He walked us through several different algorithms, and their specific applicability: Naive Bayes, Support Vector Machine (SVM), and deep learning; then a bit about machine learning scenarios inclunition rulesding supervised, unsupervised and reinforcement learning. In FlexiCapture, machine learning can be used to sort documents into categories (classification), and for training on field-level recognition. The reason that this is important for ABBYY customers (partners and end customers) is that it radically compresses the time to develop the rules required for any capture project, which typically consumes most of the development time. For example, instead of just training a capture application for the most common documents since that’s all you have time for, it can be trained for all document types, then the model will continue to self-improve as verification users correct errors made by the algorithm. Although VonBurg was unsure if the machine learning capabilities are available yet in the SDK — he works in the FlexiCapture application team, which is based on the same technology stack but runs independently — the session on robotic information capture yesterday seems to indicate that it is in the SDK, or will be very soon. Claudio Chaves Jr. of iCapt presented a session at ABBYY Technology Summit on how business process outsourcing (BPO) operations are improving efficiencies through service reusability. iCapt is a solutions provider for a group of Brazilian companies, including three BPOs in specific verticals, a physical document storage company, and a scanner distributor. He walked through a typical BPO capture flow — scan, recognize, classify, extract, validate, export — and how each stage can be implemented using standalone scan products, OCR SDKs, custom UIs and ECM platforms. 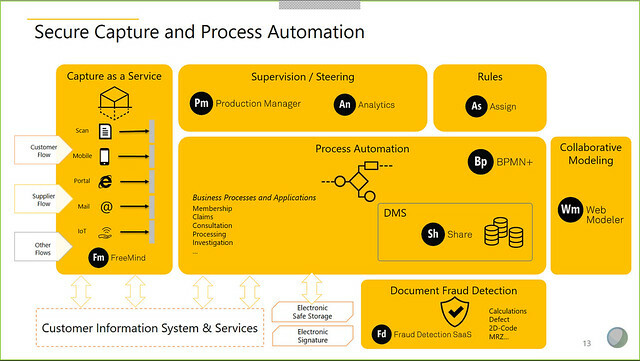 Even though this capture process only outputs data to the customer’s business systems at the end, such a solution needs to interact with those systems throughout for data validation; in fact, the existing business systems may provide some overlapping capabilities with the capture process. iCapt decided to turn this traditional capture process around by decoupling each stage into independent, reusable microservices that can be invoked from the business systems or some other workflow capability, so that the business system is the driver for the end-to-end capture flow. The microservices can be invoked in any order, and only the ones that are required are invoked. As independent services, each of them can be scaled up and distributed independently without having to scale the entire capture process. The recognize, classify and extract steps are typically unattended, and became immediate candidates to be implemented as microservices. This allows them to be reusable across processes, scaled independently, and deployed on-premise or in the cloud. For example, a capture process that is used for a single type of document doesn’t require the classification service, but only uses the recognize and extract services; another process that uses all three may reuse the same recognize and extract services when it encounters the same type of document as the first process handles, but also uses the classify service to determine the document type for heterogeneous batches of documents. iCapt is using ABBYY FineReader as a core component in their iCaptServices Cloud offering, embedded within their own web APIs that offer higher-level services on top of the FRE core functions; the entire package can be deployed as a container or serverless function to be called from other applications. They provide services for mobile client development to allow these business applications to have capture on mobile devices. He gave an example of a project that they did for recovering old accounting records by scanning and recognizing paper books; this was a one-time conversion project, not an ongoing BPO operation, making it crucial that they be able to build the data capture application quickly without developing an excessive amount of custom code that would have been discarded after the 10-week project duration. They’re currently using the Windows version of ABBYY which increases their container/cloud costs somewhat, and are interested in trying out the Linux version that we heard about yesterday. Andrew Rayner of UiPath presented at the ABBYY Technology Summit on robotic process automation powered by ABBYY’s FineReader Engine (FRE). He started with a basic definition of RPA — emulating human execution of repetitive processes with existing applications — and the expected benefits in high scalability and reduction in errors, costs and cycle time. RPA products work really well with text on the screen, copying and pasting data between applications, and many are using machine learning to train and improve their automated actions so that it’s more than the simpler old-school “screen scraping” that was dependent purely on field locations on the screen. What RPA doesn’t do, however, is work with images; that’s where ABBYY FRE comes in. UiPath provides developers using their UiPath Studio the ability to OCR images as part of the RPA flow: an image is passed to FineReader for recognition, then an XML data file of the recognized data is returned in order to complete the next robotic steps. Note that “images” may be scanned documents, but can also be virtualized screens that don’t transfer data fields directly, just display the screen as an image, such as you might have with an application running in Citrix — this is a pretty important capability that is eluding standard RPA. Rayner walked through an example of invoice processing (definitely the most common example used in all presentations here, in part because of ABBYY’s capabilities in invoice recognition): UiPath grabs the scanned documents and drops them in a folder for ABBYY; FRE does the recognition pass and creates the output XML files as well as managing the human verification step, including applying machine learning on the human interaction to continuously improve the recognition as we heard about yesterday; then finally, UiPath pushes the results into SAP for completing the payment process. For solution developers working with RPA and needing to integrate data captured from images or virtualized screens, this is a pretty compelling advantage for UiPath. It’s the first session of the last morning of the ABBYY Technology Summit 2017, and the crowd is a bit sparse — a lot of people must have had fun at the evening event last night — and I’m in a presentation by another ex-FileNet colleague of mine, Carl Hillier. He discussed how capture isn’t just a discrete operation any more, where you just capture, index and store in a content management repository, but is now the front end to business processes that have the potential for digital transformation. 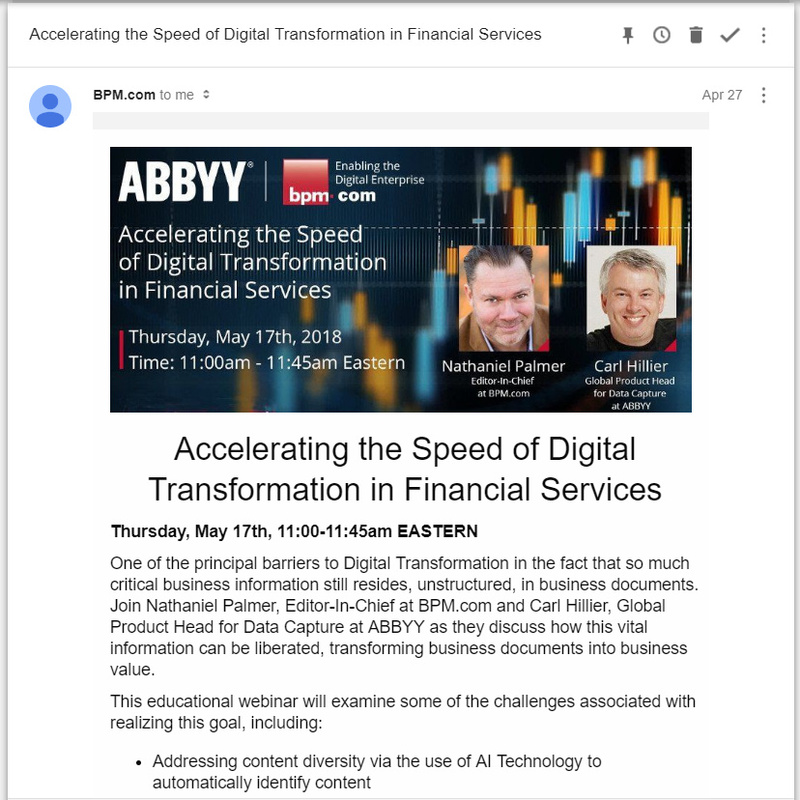 To that end, since ABBYY has no plans to expand their side of the business, they have made strategic partnerships with a number of vendors that push into downstream processes: M-Files and Laserfiche for content management, Appian and Pega (still in the works) for BPM, and Acumatica for ERP. 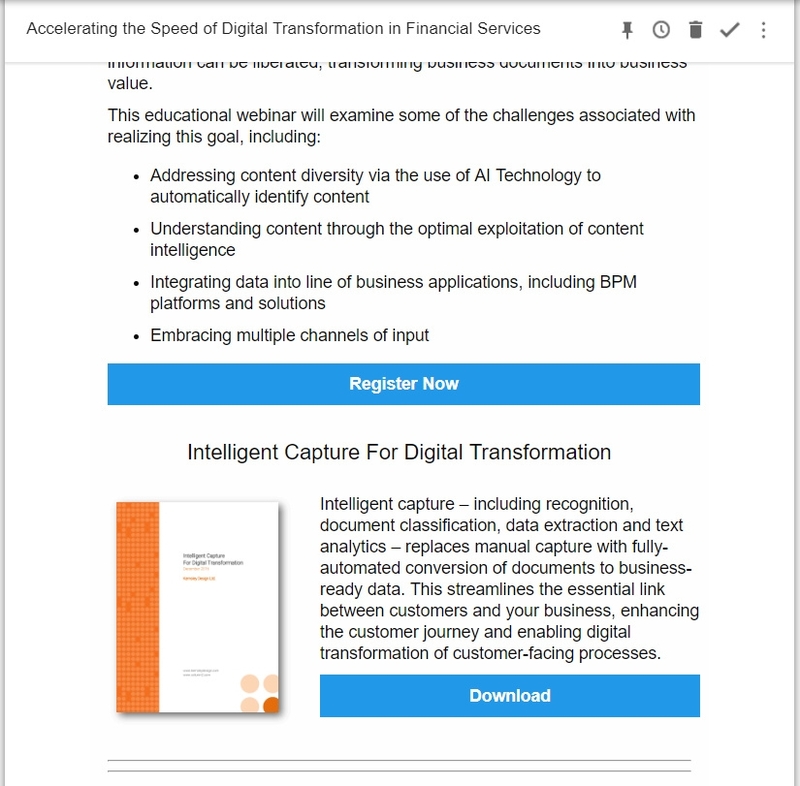 As with many technology partnerships, there can be overlap in capabilities but that usually sorts out in favor of the specialist vendor: for example, with Laserfiche, ABBYY is being used to replace Laserfiche’s simpler OCR capabilities for customers with more complex capture capabilities. 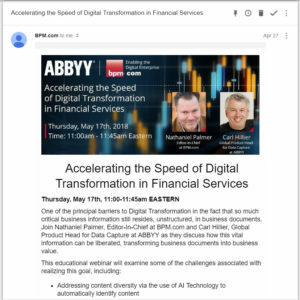 Both BPM vendors have RPA capabilities — Appian through a partnership with Blue Prism, Pega through their OpenSpan acquisition — and there’s a session following by RPA vendor UiPath on using ABBYY for RPA that likely has broader implications for working with these other partners. For the solution builders who use ABBYY’s FlexiCapture, the connectors to these other products gives them fast path to implementation, although they can also use the ABBYY SDK directly to create solutions that include competing products. We saw a bit about each of the ABBYY connectors to the five strategic partners, and how they take advantage of those platforms’ capabilities: with Appian, for example, a capture operator uses FlexiCapture to scan/import and verify documents, then the connector maps the structured data directly into Appian’s data objects (records), whereas for one of the content management platforms, they may transfer a smaller subset of document indexing data. The Acumatica integration is a bit different, in that FlexiCapture isn’t seen as a separate application for the capture front end, but it’s embedded within the Acumatica interface as an invoice capture service. ABBYY’s plan is to create more of these connectors, making it easier for their VARs and solution partners (who are the primary attendees at this conference) to quickly build solutions with ABBYY and a variety of platforms. Dimitry Chubanov and Derek Gerber presented at the ABBYY Technology Summit on ABBYY’s mobile real-time recognition (RTR), which allows for recognition directly on a mobile device, rather than just capturing content to pass on to a back-end recognition server. Mobile data capture comes in two basic flavors: first, the mobile user is just entering data, such as an account number or password; and second, the mobile user is entering both data and image, such as personal data and a copy of their ID. ABBYY RTR isn’t based on taking a photo and then running recognition on that image; instead, it uses several frames of image from the camera preview stream and runs recognition algorithms on the stream without having to capture an image. This provides a better user experience since the recognition results are immediate and they don’t have to type the data manually, and better privacy since no image is captured to the phone or passed to any other device or server. They demonstrated this using a sample app on an iPhone; it’s interesting to see the results changing slightly as the phone moves around, since the recognition is happening using the previous several frames of video data, and it gradually gains recognition confidence after a few seconds of video. We saw recognition of unstructured paragraphs of text, drivers licenses, passports and bank cards. The SDK ships with a lot of predefined document types, or you can create your own by training for specific fields using location and regular expressions. They are also offering the ability to capture meter data, such as electricity meters, although some of this requirement is being by smart meters and other IoT advances. They also have a mobile imaging SDK that can capture an image when it’s needed — for proof of ID, for example — with scene stabilization, document edge detection, deskewing and various types of image enhancement to capture the optimal photo for downstream storage and processing. I can imagine, for example, a mobile airline app that needs to capture your passport information using mobile RTR to grab the data directly rather than having you type it in. I’ve also seen something very similar used to capture the unique number from an iTunes gift card directly into the App Store on an iPhone. Just like QR code reading is now built right into the search bar on the mobile versions of Google Chrome, and Google Translate on mobile allows real-time capture of text using the same camera preview mode (plus simultaneous translation), being able to capture text from a printed source instead of requiring a mobile user to type it in is likely to become ubiquitous in mobile apps.